This information was prepared for Mrs Daphne Cassidy, as requested at the WW1 book launch event. Walter Edward Stanley was born in Nottingham in 1891, the son of John Stanley, born in Radcliffe, Nottinghamshire, in 1859, and Ann Stanley (nee Derrick), born in Wysall, Notts, in 1861. His parents married on the 25th December, 1882, at Holy Trinity, Wysall. According to the 1891 census his father was a ‘hay trusser’, and lived with his family at 41 Ryhill Street, Nottingham. At this time, he had older brothers and sisters who were Annie, aged 6, (John) Alfred, aged 5, and Herbert, aged 2. Walter was only two months old at the time of the census. By 1901 the family had moved to 120 Wilford Road, Nottingham, and his father was now a corn dealer. There were six children. His sister Annie, aged 16, who was working as a lace machinist, his brother John (aged 14), an assistant to a corn dealer (his father), Herbert (12), Walter (10), Frederick (8) and Ernest (3). According to the 1911 census the family had moved to Eastwell, near Melton Mowbray, where his father John was recorded as a farmer. Walter, now aged 20, and with his brother John (24) worked on the farm with their father. Frederick, aged 18, was working as a wheelwright and was recorded as a visitor on the census. Ernest, aged 13, was still at school. Their circumstances appear to have improved, as the census also records that they had 3 servants – Charles Hill, 21, a cowman on the farm, Alfred Franklin, 15, a farm labourer and May Bromley, aged 16, a domestic servant. Walter and his parents were among the mourners at the funeral of Miss Rose Hubbard in Eastwell by the Grantham Journal on the 29th January, 1910. Walter was again named by the Journal of the 31st December 1910, giving a recitation at a Wesleyan Chapel social at Eaton, near Eastwell, which was presided over by John Stanley, presumably Walter’s oldest brother. To date, his service record has not been found, and it may well be one that was destroyed during World War 2. However, a Medal Index Card has been located which states that Lance Corporal Walter E. Stanley served initially in the Leicester Yeomanry, no 2667, and was promoted to Sergeant. He was then moved to the Corps of Hussars (Prince Albert’s own), service number 255560. The card also states that he joined up on the 10th February, 1915, and disembarked (i.e. was discharged) on the 5th March, 1919. He served in France. This information is corroborated in a report, entitled ‘A Soldier’s Wedding’, of his marriage, in the Grantham Journal, January 1st 1916. It describes how the village (Eastwell) had the honour of welcoming home Lance Corporal Walter Stanley who had been on 11 months of active service in France with the Leicestershire Yeomanry. It goes on to say that Lance Corporal Stanley left his duties on December 21st and “made a quick journey”. He was married on December 22nd 1915, at the Wesleyan Church, Loughborough, to Miss Sarah Towle, daughter of Mr. & Mrs. S. Towle of Burton–le-Wolds, Loughborough. Immediately after the ceremony, the wedding party proceeded by motor to Eastwell, the bridegroom’s home. The article adds: “L.-Cpl Stanley has had some thrilling experiences and narrow escapes, being with his troop when the Leicestershire Yeomanry was so badly cut up in May. He also had a serious illness, resulting from a kick when re-tethering some horses that had broken loose in the night and his life was probably saved by the steel mirror which he had in his pocket. He returned to his duties on Monday (27th December), and all friends join in wishing him a safe and speedy return home”. According to The Long Long Trail website, the Leicestershire Yeomanry was formed in 1908. There were two active battalions, the 1/1st and the 2/1st , and a third training battalion. The 1/1st formed part of the 3rd Cavalry Division during 1915, and was in May 1915 involved in the Battle of Frezenburg Ridge, part of the 2nd Battle of Ypres, which may well have been where the battalion was “badly cut up”, as recounted by the Grantham Journal (see below). The 2/1st was moved to Salonika late in 1915, so it seems unlikely that Walter Stanley was part of this battalion. In the 1917 renumbering of the Territorials, the Leicestershire Yeomanry issued numbers from the block 255001-260000, Corps of Hussars. 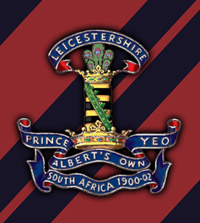 The cap badge of the Leicestershire Yeomanry carried the words “Prince Albert’s Own Yeo[manry] South Africa 1900-1902”, indicating the Hussars’ proud record of service from the earlier campaign. He was awarded the 1915-Star, the Victory Medal and the British War Medal. According to the roll for the Corps of Hussars, he served alongside the following men also with the surname Stanley. It may be that some were relations. It would appear that he returned to the farm in Eastwell and was active in his local community and Wesleyan church. In 1926, he gave an address at the Wesleyan Sunday School Anniversary. There is a newspaper report from the Belvoir Police Court in 1927, of two men prosecuted for trespassing in the daytime in search of conies on land in the occupation of Walter E. Stanley. By 1932, he was the Chairman of a Parish Meeting in Eastwell regarding the closure of the Eastwell School (built by the Duke of Rutland in 1875) and the appointment of a representative on the Scalford Schools Managers committee. In the national register of 1939, Walter E Stanley, born Feb.7th 1891, was a farmer living at Eastwell Lodge, with his wife Sarah 15th March 1888 and two sons Leslie, born 27th December 1879 (an obvious error) and Clifford, born 25th December 1920, both registered as assisting their father on the farm. Walter Stanley died in 1968, aged 77.